The Chinese electronics manufacturer Ainol has unveiled its latest tablet, called Novo 10 Captain. According to the company, the portable device runs on an Android 4.1 Jelly Bean operating system and is now available for purchase, priced at $212.90 (8GB model). 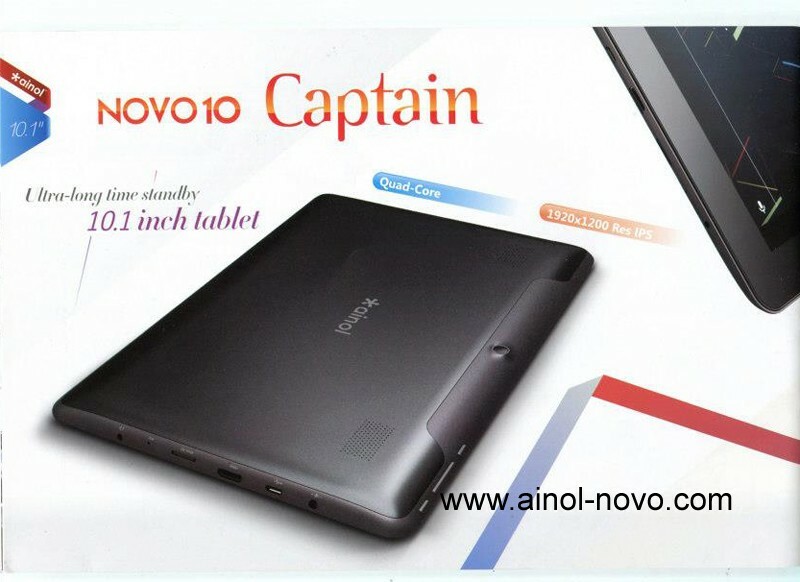 The Novo 10 Captain is the fifth tablet from Ainol this year after the previously launched Crystal, Aurora II, Mars and Tornado. It is equipped with an ACT-ACT7029 central processing unit that offers four cores clocked at 1.5GHz and the integrated Mali 400 GPU. In addition, the slate PC comes with a 10.1-inch capacitive IPS multi-touch (5 points) display of 1920-by-1080 pixels maximum supported resolution. Beneath the Full HD panel, the Novo 10 Captain features 1GB of RAM, 8GB of flash storage and a 10,000mAh battery (no word on battery life, though). Users are reportedly further provided with Wireless LAN 802.11 b/g/n and Bluetooth modules, an HDMI 1.4 output, one mini-USB port, a microSD card reader slot (up to 32GB) and a GPS receiver. Measuring 9.5mm (0.37-inch) thick, Ainol’s new mobile device comes with a 2.0MP rear shooter and a VGA front-facing web camera for video calls. Moreover, the manufacturer claims this tablet weighs 669g (1.47lbs), supports Flash version 10.2 and is Google-approved, which means it offers built-in access to the Google Play store.